In the US before the 1950s, office design mostly consisted of row upon row of chairs and desks. Staff would sit in lines to do routine repetitive tasks that could easily be checked by a supervisor walking the line—the factory approach to clerical production. The pace of change was slow. That’s despite employer outliers like Milton Hershey. The founder of Hershey’s chocolate had already built a model town with schools and recreational facilities for his factory staff around their Pennsylvania chocolate factory by 1905. Bell Labs, whose reputation as an “Ideas Factory” peaked around the 1960s, did a lot to connect ideas of space with innovation. It wasn’t enough that the company employed fifteen thousand people, “including some twelve hundred PhDs”. In their development of everything from lasers to solar panels to cellular phone networks the company, under their director Mervin Kelly, encouraged staff to make diverse connections. At their headquarters engineers, scientists, manufacturers, and salespeople often bumped into each other in the building’s deliberately long corridors. But despite the progress made by collaboratively-minded companies like Google, the trajectory of modern office design isn’t irrevocably moving towards more openness. Lately, there’s been a pushback with employees reasserting their right to personal space. The Wall Street Journal recently noted that “open offices are losing some of their openness” with companies looking to rearrange floorplans to avoid distractions to their staff with quiet areas and even soundproofed rooms. 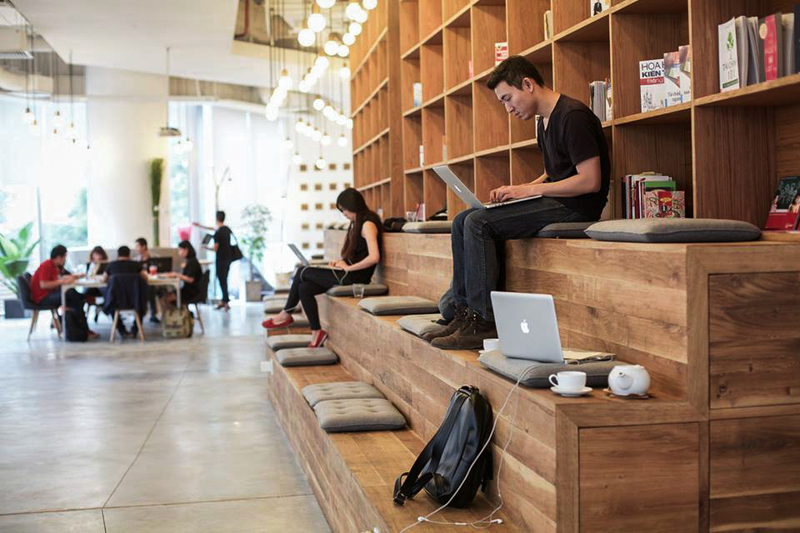 So what impact is boundary-pushing workplace design having on Vietnam? And how are office spaces here finding the middle ground between allowing ideas to coalesce without causing undue distractions? 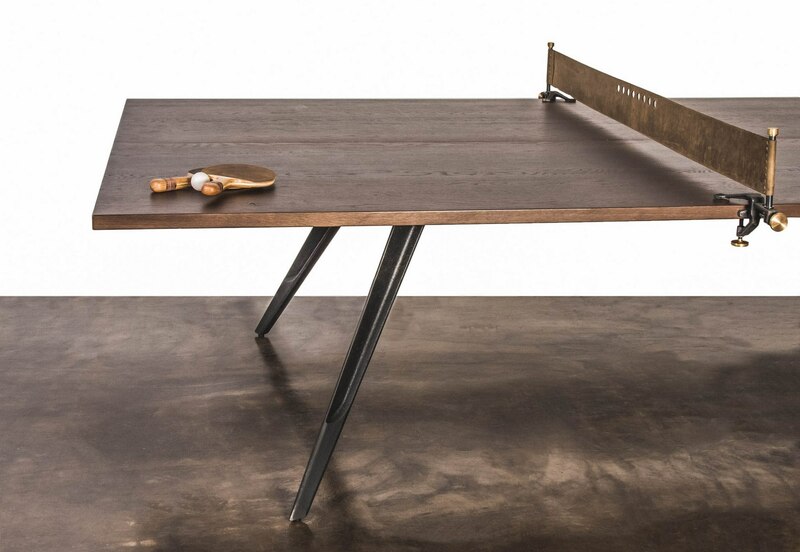 District Eight, a modern-industrial furniture company with a proudly made-in-Vietnam production philosophy make chic renditions of games pieces. According to their Production Manager, Marcus Loke, the company have been making the games since 2012. “The first one District Eight produced was a foosball table. 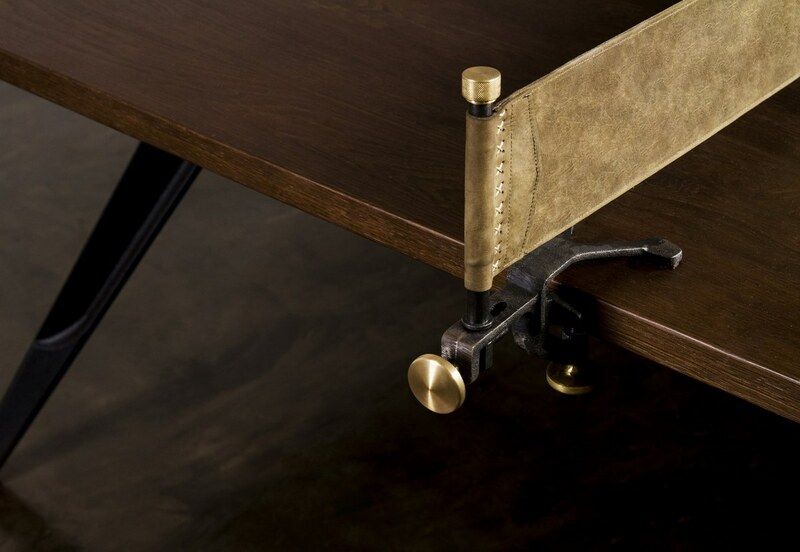 It’s made from a combination of materials—a granite base for the table, and a body made of reclaimed wood, and aluminum, brass, and steel are all used in the moving components and other parts,” he explains. Marcus is seeing firsthand the impact of having games in District Eight’s headquarters where they have a table tennis and a foosball table at one end of their office building’s third floor. “You don’t need to check the time. 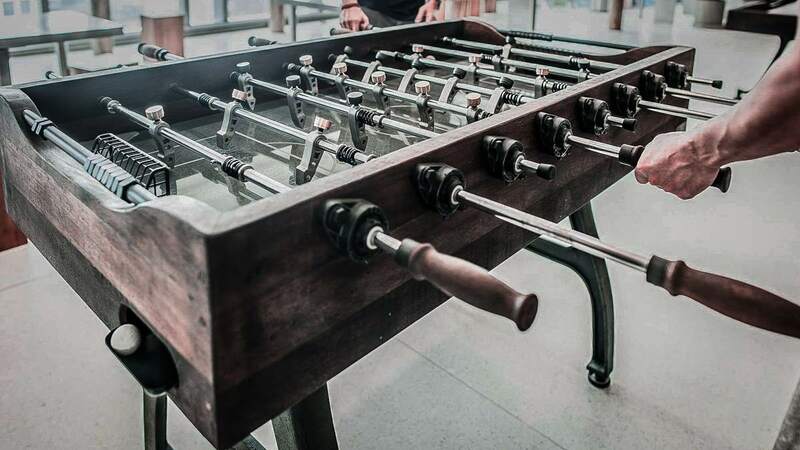 You know immediately when it’s twelve—our staff’s lunchtime—because the rattle of the foosball table starts,” Marcus laughs. “Everyone will be queuing up asking for their turn. A great sense of camaraderie has developed between the staff,” he adds. “But the ping pong table is my domain. Still, I’m not the office champion. My technique is good, but my consistency is bad whereas we have some staff less technically proficient, but who play consistently,” he shakes his head. AIA, the pan-Asian life insurance group have their head office in the Saigon Center building. 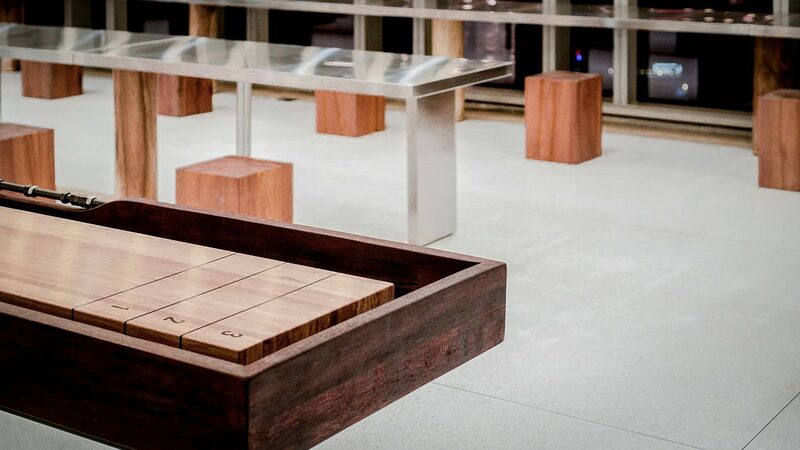 In the cafeteria of the office, designed by The Lab Saigon, you can also find District Eight’s games pieces. The Lab Saigon, who are also behind Anan Saigon and Bunker Bed and Breakfast, were asked to create a workplace reflective of the company’s innovative work in Vietnam. Functionally, the space is also a meeting point for AIA’s teams who are scattered across three locations. The Lab Saigon’s creative director Tuan Le, who we recently spoke to in their Label Concept Store, proposed a series of transitions—reception area into garden; staircase into a stage for town hall meetings; meeting space into event space; cafeteria into games room. “We chose to add in District Eight’s games because they are interactive recreational pieces, but they are also very decorative—when nobody is playing, they still look amazing,” Tuan explains. 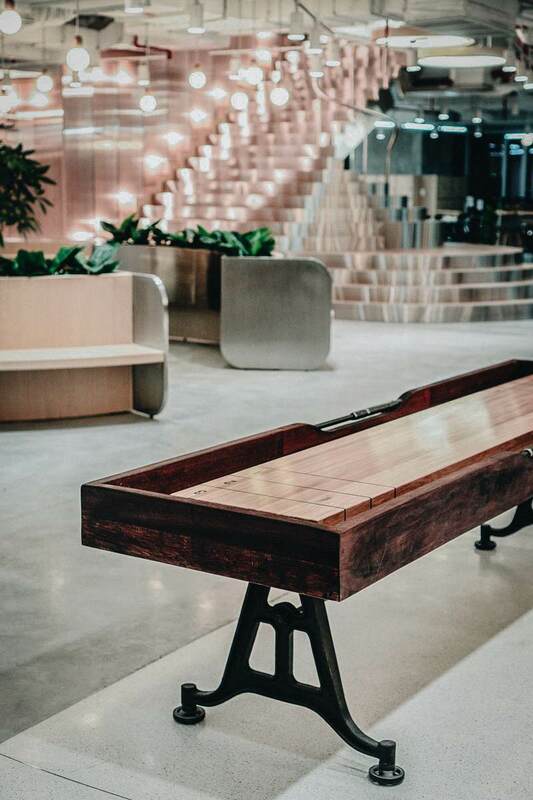 “My first impression of the foosball and shuffleboard tables was how great they looked too—well-crafted and elegant. They really do look more like decorative pieces than functional games,” Ly Nhon, AIA’s CFO, agrees. 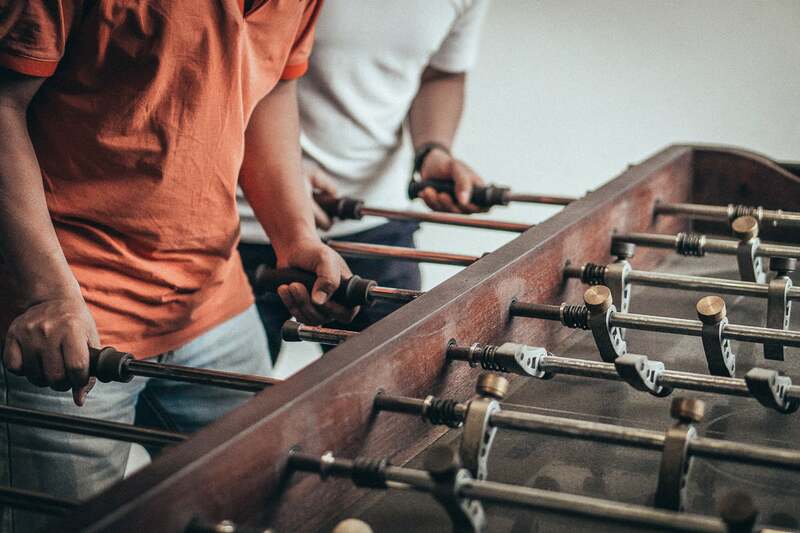 Like Marcus at District Eight, Ly Nhon has also noticed that the games, along with a more modern office design employing additional concepts like free-seating and greater openness, are having a positive impact. “There is a palpable sense that we are promoting innovation and creativity, especially compared to our previous workplace which employed traditional cubicles, enclosed meeting rooms, and where seating was assigned to staff. This is a major change for us,” Ly Nhon confirms. “Over time I’ve become more aware of the impact of the games pieces on the teams here. Staff have expressed appreciation that we are promoting non-traditional ways to interact in our office. This also helps to remind them that the company they work for is open to trying new things in the pursuit of employee satisfaction,” AIA’s CFO smiles finally. “Bell Labs was a golden era,” their director of acoustic research, Dave Matthews, once told a Wired writer. It seems Vietnam is moving towards its own golden era with its developing start-up eco-system, and with high-end Vietnamese brands making inroads into international markets. And right now, it’s being driven from offices designed by local designers like Lab Saigon with the same philosophies that helped Bell to become an unstoppable corporate powerhouse.